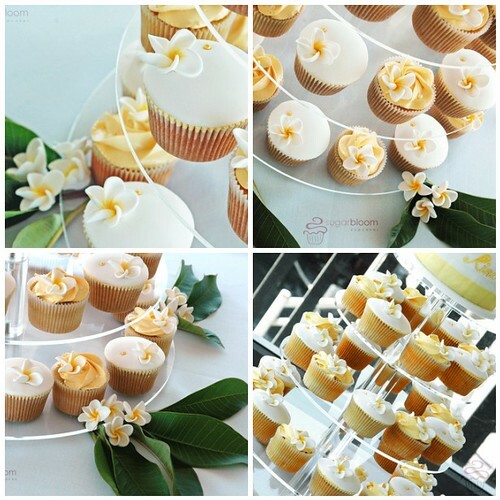 A fresh Plumeria design for a sunny November Wedding. Coconut Cupcakes with Tahitian Vanilla Buttercream and Vanilla Cupcakes with Lime Coconut Cream Buttercream. bev these are stunning! and the combos sound yummy, esp the coconut,lime and pineapple buttercream......OMG!!! HEAVEN! Really lovely, simple & elegant. Thanks ladies! This set up looked sooo gorgeous in situ. Dear Bev, I had the priviledge of being invited to the wedding last night and the opportunity to taste the cupcakes. Just wanted to let you know the cakes are just FANTASTIC! Thank you very much Paul, I am thrilled that you hold my work in such regard! I heard from Rino that it was an amazing and beautiful day. Hello, girl. I'd like to know if there is a way to contact you and arrange for my sister's wedding. It will on October but she totally loves your cakes, so I'm planning to give her a surprise.